Today I’d like to give small review of forex broker Esplanade Market Solutions. The company offers in 2017 the free $50 as welcome bonus for new clients. I mentioned this free sign up forex bonus in my huge list of no deposit bonuses. As you see, this is the standard registration procedure. During the registration process, do not forget to choose “Standard” type of trading account. Then you should login to account at Esplanade Market Solutions site and pass the account verification. To verify your trading account you have to go in “My profile” section. There you should upload electronic copies of your docs for verification. After approving and verifying your account by broker’s support you have to apply for no deposit welcome bonus. To do this you need to send the letter to bonus@esplanade-ms.com with your bonus request. 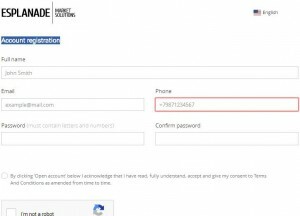 In the letter body you have to input the trading account number, which you’ve opened at Esplanade Market Solutions. The bonus can’t be cashed out. You may withdraw only your trading earnings. Broker set the minimum trading volume before you may request your trading profit. It’s equal 10 standard lots. Besides this, the maximum sum of trading profit which you may withdraw can’t be more than $100. So, now some words about broker. Esplanade Market Solutions is offshore broker from Saint Vincent and the Grenadines. At broker’s site I’ve found information, that broker is regulated by the Securities and Exchange Commission of the Republic of Vanuatu (VFSC). Such jurisdiction is not quite reliable, in my home opinion. About trading platform. Broker offers to use for trading Metatrader 4. MT4 is very popular, stable and reliable with different use ful functions and options for traders. Clients are offered many usual ways for money withdrawal from Esplanade Market Solutions . You may deposit/withdraw money through Visa and Mastercard, bank wire, Qiwi, Webmoney, Fasapay. So, i do not see any problems with deposit/withdrawal. About trading conditions. Esplanade Market Solutions offers 4 kinds of trading accounts in USD or EUR: Fix, Standard, ECN, VIP. They allow to use 1:1000 max credit leverage. Traders may use for trading about 50 forex pairs, spot metals, indices, commodities, shares. Minimum deposit for start is $100. Minimum size of trading order is 0.01 lot. Final conclusion. Esplanade Market Solutions is suitable for trading, but you should always remember about risky offshore jurisdiction of company. Of course, do not forget to test them via using no deposit welcome bonus on real trading account “Standard”. I trade with esplanade quite successfully. Sometimes I get drawdowns, but generally I profit and I’ve never drained my whole deposit. I never use trading signals when trading. I think they’re just a useless animation feature. I prefer reading charts correctly and I’m not afraid of taking risks. Someone said, that those who don’t risk actually risk even more. The esplanade broker, with which I trade, has quite tolerable terms for trading. Mt4 platform is convenient for trading and there are things to trade with. Orders are quickly performed and I’ve never noticed any requotes when trading. Since I’ve been trading with esplanade I’ve never seen any promotions. I don’t need them, but they sometimes improve the broker’s image. I once traded very successfully with the pound/yen pair. I’d usually avoid such combinations. And here everything worked perfectly well on the falling trend. I’m going to withdraw profit soon, esplanade has no problems with that. I don’t know what to say about the broker you stop noticing during your trading. It’s probably its main advantage. It means everything goes right and the trader doesn’t get distracted. In my case, the same thing happens with esplanade. It’s the most ordinary broker, but it’s absolutely comfortable to trade here. Metatrader 4 works fine, and there’s everything there should be. The spreads are tolerable, you can choose how to trade either with the fixed or the floating ones. They are different on different accounts. The minimum deposit to start trading is low, only $100. Fixed spreads start from 2 points on the fix account and 1,2 on the standard one. On the ecn and vip accounts the spreads are floating starting from 0. I just don’t understand why swaps are so different for buying and selling. For the eur/dollar pair swaps for purchase are 1,74, and for selling equal -5,66. But I don’t know how to analyze it yet. I need to clarify it. The broker has its pros and cons, but overall the company Esplanade Market Solutions turned out to be fine. I opened the account with them three months ago. The spread is floating, that’s why there are sometimes expansions. That is a usual thing for this type of account. I liked that the broker has a wide selection of assets from standard currency pairs to the most popular cryptocurrencies. Also, funds deposit and withdrawal work perfectly. There was no delight. Thou the company is not bad, there still are drawbacks. During my trading I liked good orders execution, that there’s cfd and that you even have an opportunity to trade with cryptocurrencies. And funds withdrawal is also fine. But the fact that they don’t have a top up bonus is a little upsetting. And I was very pleased with the rest, especially with the funds withdrawal. It’s credited quickly and fairly. I’ve opened an account and thought that the verification process would take some time. But no, everything was done in a day and I was already able to withdraw profit. It was a welcome surprise. I haven’t noticed any broker’s interference while trading; the orders haven’t opened or closed themselves. The withdrawal of funds works fine. Before getting an account here I’ve read some reviews. Some of them were really posistive and some were not. I tried to be as objective as possible and I’d say it’s a pretty standard broker. The contidions are nice, there are both floating- and fixed-spread accounts. Plus, there are no probles with money withdrawals. But, then again, I think the Esplanade Market Solutions withdrawal is slow and it took the support quite a long time to reply a couple of times. Anyhow, trading is ok but there are some subtleties. Whatever they say, this broker is pretty good. The assets pool is ok, may have been better, the spread is alright and conditions are fine. However, you need USD 20,000 to open an ecn account which is a lot, in my opinion. But, all in all, I like this broker. I’ve heard good feedbacks about Esplanade Market Solutions. Now, I don’t have enough time to start trading with no deposit bonus from Esplanade Market Solutions, but next year I hope to start it. But I did like the broker. Platform works without failures, requotes don’t bother me. I have a Basic account with variable spread, so sometimes expansions are pretty high. However I don’t trade on news, don’t care about them. Write a comment to "Bonus from Esplanade Market Solutions"